Media library is an element of website builder WebWave, which allows you to store files used during website creation. It simplifies access to graphics and enables working on your project on many computers. In order to open media library, in website builder go to "Settings" and select "Media library". To upload files, drag them to Media library window or click on "Select files" and select them on your device. WebWave media library supports every file extensions BUT exe, bat, msi, sh, bin. 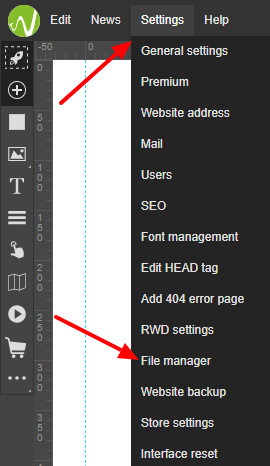 To delete a file, select it in Media library and on the right side click on "Delete permanently". Keep in mind that if you delete a file from Media library, it will be also removed from your website. You can also delete a couple of files at once by selecting them all and clicking "Delete permanently". You can use files uploaded outside of the builder. Select the file and use its URL address.